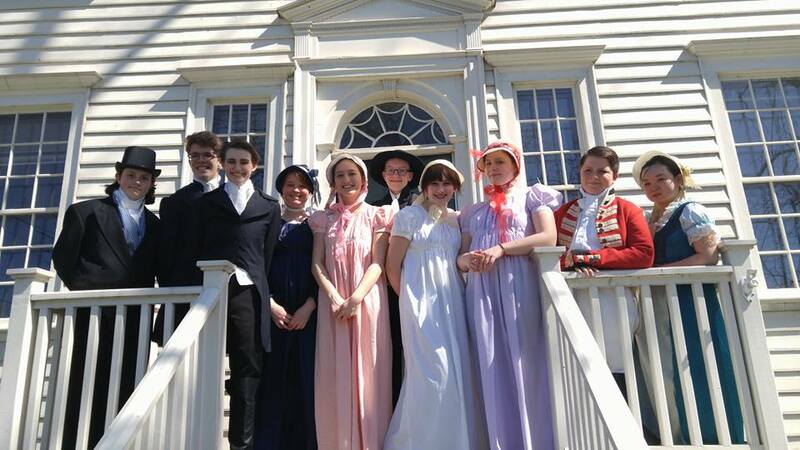 Pride and Prejudice in a Period Home! 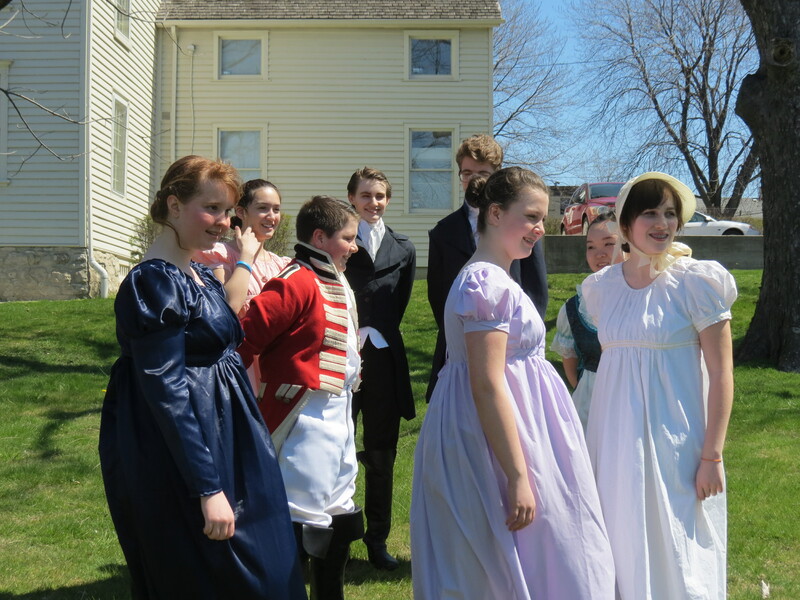 This afternoon, some of our “Riverfrontiers” had a rather unique opportunity – we were invited to hold a special performance of a selection of scenes from Pride and Prejudice in an authentic setting – inside the parlour of one of Canada’s oldest homes, the Duff Baby House at 221 Mill St.
Les Amis Duff Baby is a volunteer group dedicated to the support and promotion of Windsor’s oldest house, built in 1798. 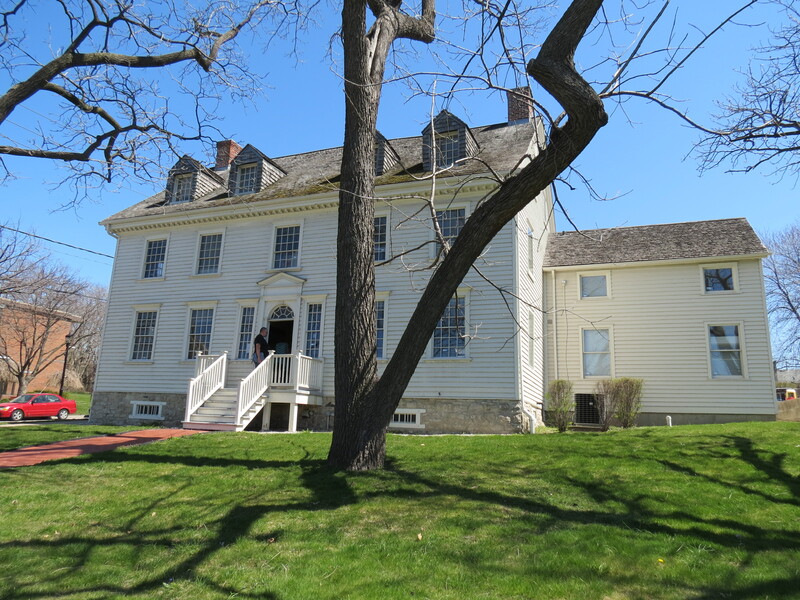 The house, at 221 Mill St., is a beautiful ongoing project which makes an incredibly authentic setting for the performance of Pride and Prejudice. 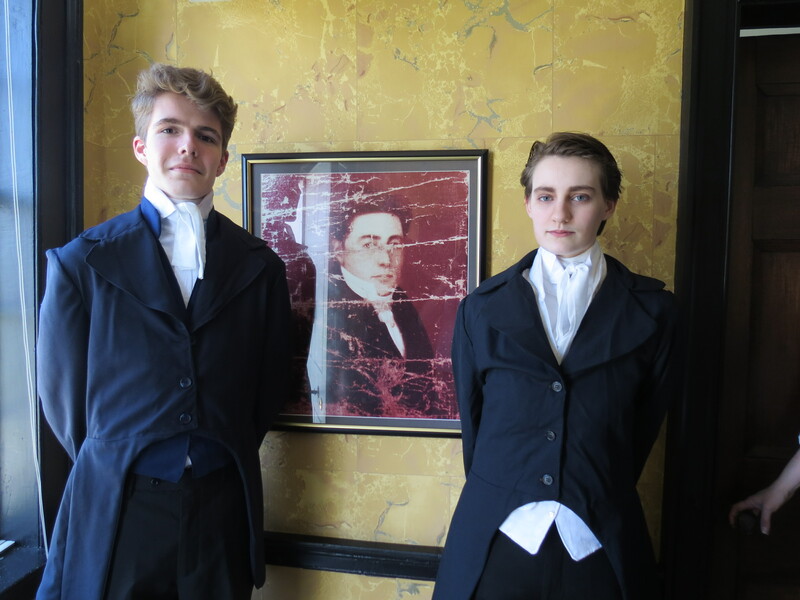 We were invited to perform some scenes following the group’s annual general meeting. We couldn’t have asked for a better audience – we felt so welcomed and appreciated! 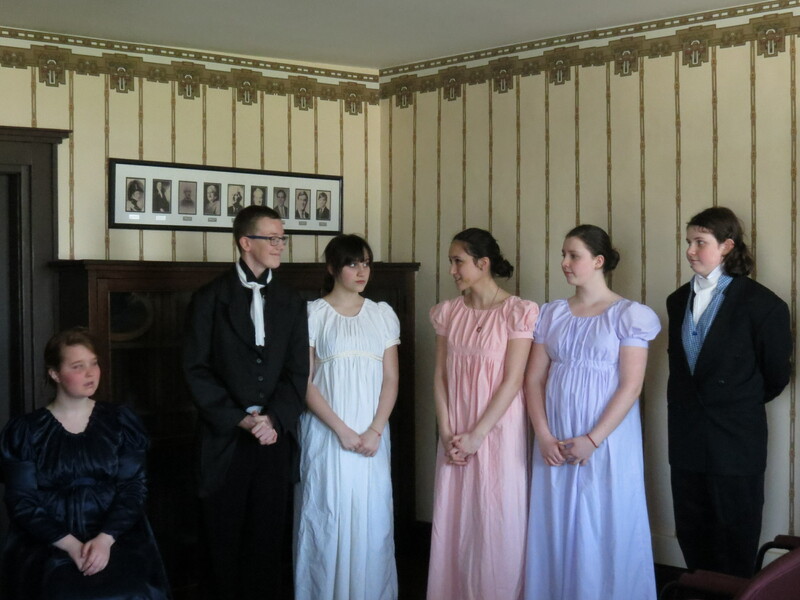 And the cast was definitely impressed with the intimacy of performing in a small, period setting for the scenes. 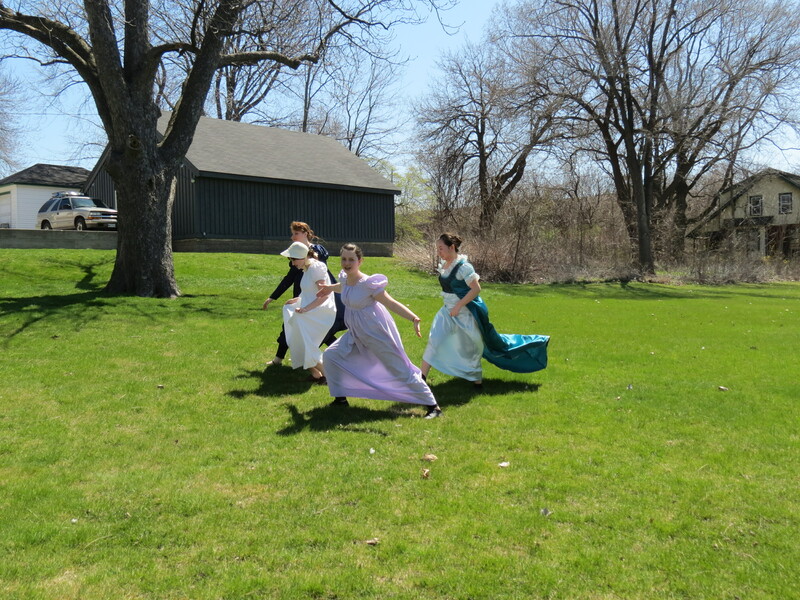 Everyone enjoyed the warmth and sunshine of the beautiful grounds! 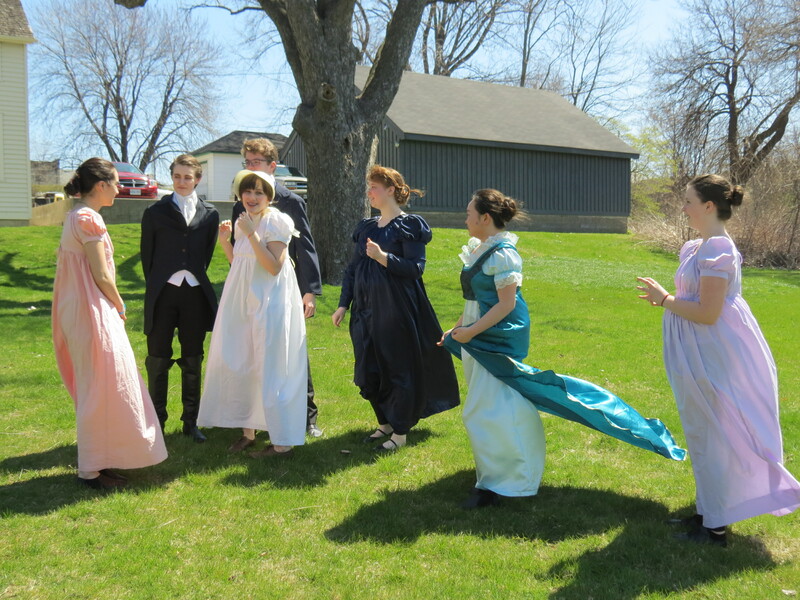 Even Mr. Collins and Lady Catherine were in a cheery mood! 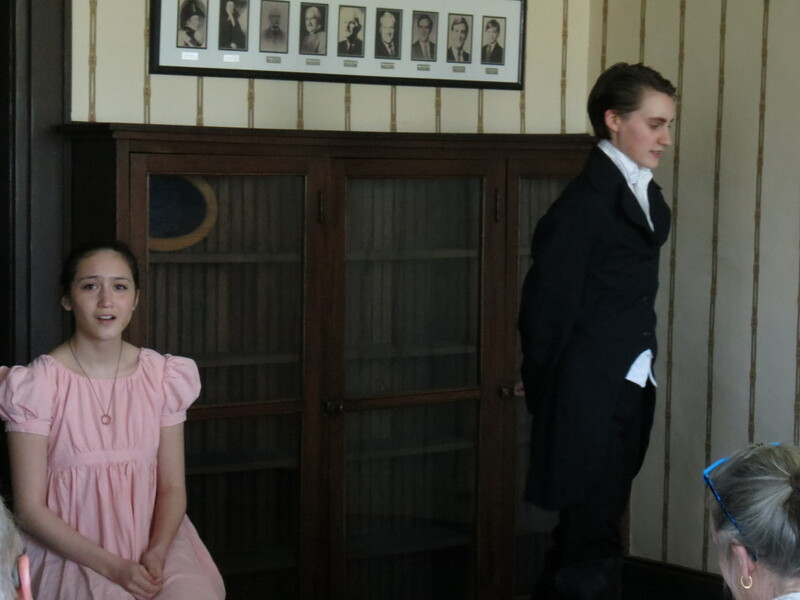 But in the end, we went inside to perform three scenes from the play. 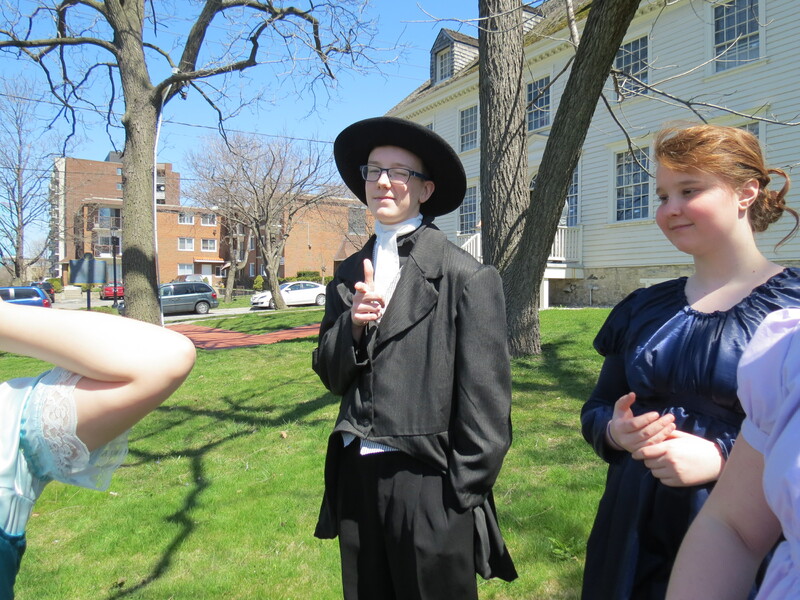 We thought it irresistible to begin with Mr. Collins proposal to Elizabeth Bennett. There were a lot of chuckles. 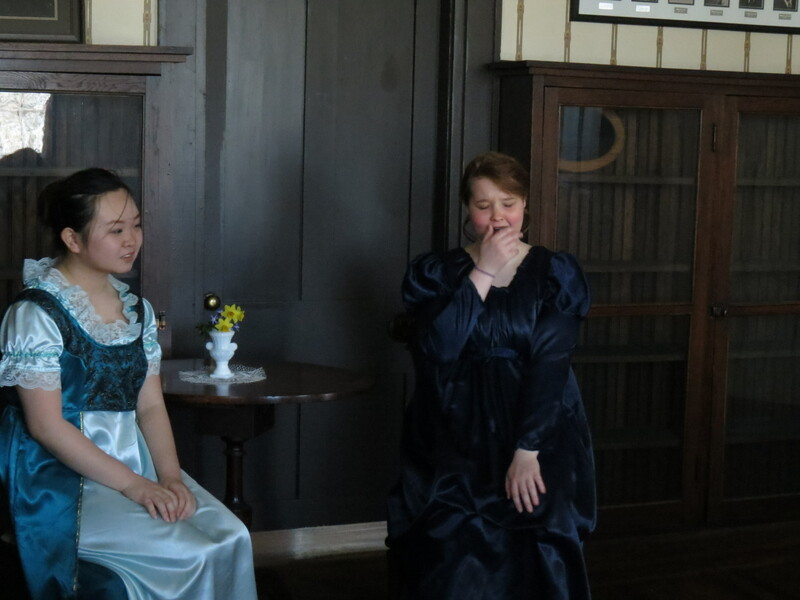 Next, it was off to Rosings, where we had a scene with Lady Catherine de Bourgh, and her daughter, Lady Anne de Bourgh. Lady Catherine is aghast at the various ways in which Elizabeth Bennet’s family is so very unconventional. 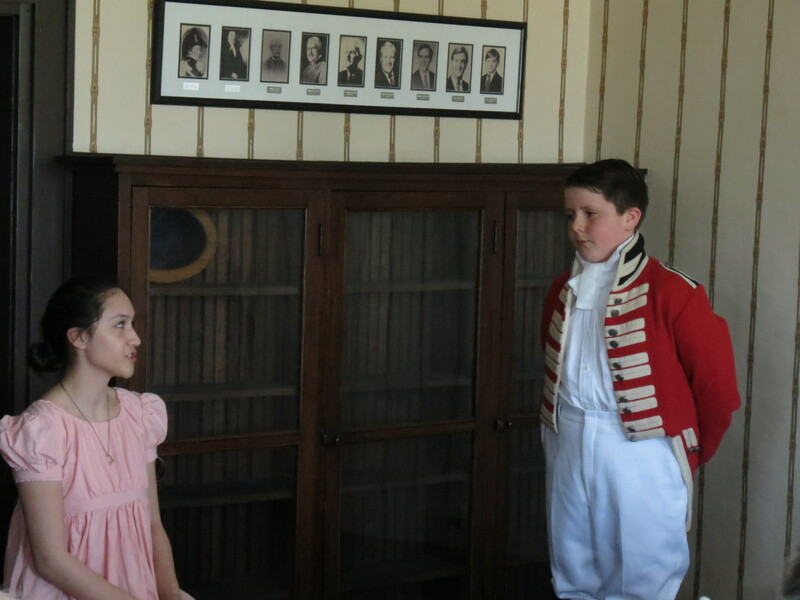 Colonel Fitzwilliam drops by to deliver the bombshell about Darcy sabotaging the relationship between Bingley and Jane. Elizabeth’s blood is set to boiling, just in time for Darcy’s arrival. His proposal of marriage is not what Elizabeth had any expectation of receiving from him. 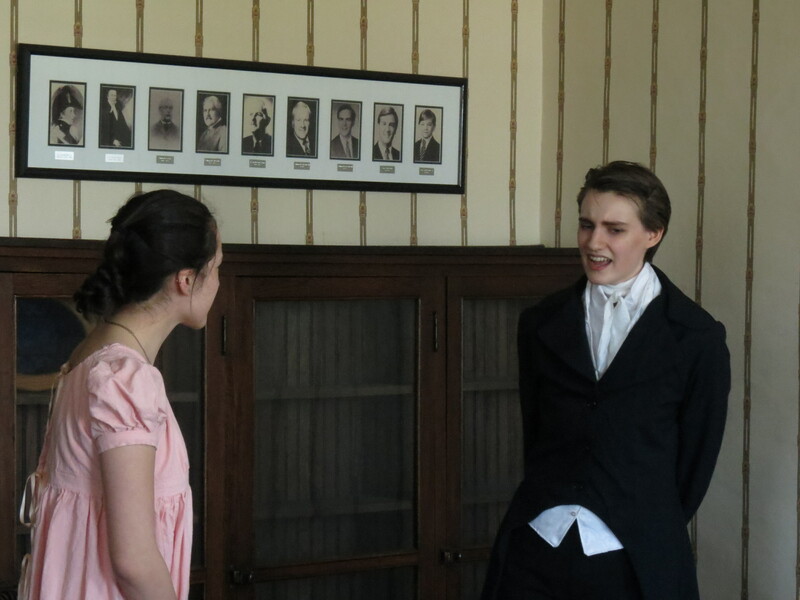 Elizabeth’s refusal shocks Darcy, and he is more than a little indignant. All in all, it was a wonderful afternoon. The performance was followed by a little Q&A session, and a series of lovely conversations with members of the audience. It was a great opportunity and we were so glad to be asked! 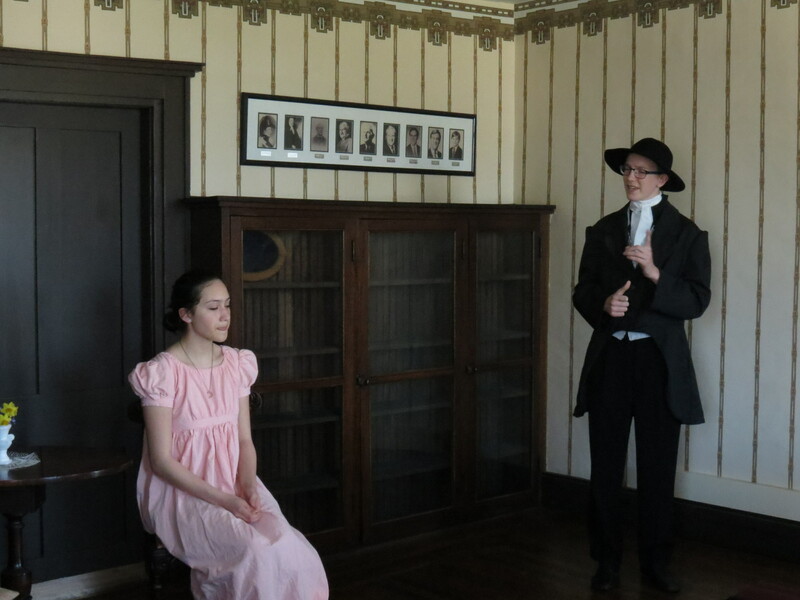 Our students were all intrigued by the history of the house. None of us had been inside before, but we were certainly pleased to have had the experience today! Enthusiastic thanks to Les Amis Duff Baby for extending the invitation, and kudos to our students for retaining their lines for two months, while still in preparation for Aladdin and the Arabian Nights! We’ve just established our casting for the plays coming up this season, and I’ve reminded our Costume Director of your kind offer! Thank you! Previous: Previous post: We're getting closer to Aladdin! Next: Next post: Construction and Choreography!